When you set out to purchase a telescope, ask yourself, what do you want to see? Do you want to be able to see planets and bright, pulsing stars? Maybe you want to be able to view objects but aren’t keen on purchasing the most advanced telescope on the market. Telescope manufacturers construct different telescopes according to the user’s needs. Some are specialized in astrophotography—taking pictures of the various objects in the night sky. Others are simple and easily assembled for children to get the most out of them. In this guide, we will explore what you will want to look for in a good telescope when you decide to purchase one for the first time. We only wish we could provide you with the power of the Hubble Space Telescope in your hands. But with this guide, you’ll be looking at the most affordable and accessible options. For further information on the individual and more accurate parts of different telescopes, check out our guide here. There are some different features that you should consider when seeking to buy a telescope. However, some things could deter you from buying one as well. For instance, some telescopes and their ads talk only about the power of the telescope. Even though power can be a major feature, which you will learn shortly, generally, a telescope that has a large power ad is on the lower end of quality. As we mentioned earlier, different telescopes are built for specific purposes; you make sure you’re looking at one that suits your needs. However, there are basic features that most telescopes will have. The aperture of a telescope can refer to one of two things: the objective mirror of a reflector or the objective lens of a refractor. This is the part that gives a telescope “power”. The aperture is required to let the light into the scope, and therefore, this is why it is important to look at. For most amateurs, you want a refractor around 2.4 inches to 3.1 inches and a reflector around 4.5 inches to 6 inches. With this aspect, one saying comes to mind, “You get what you pay for.” This saying is particularly the case when purchasing a telescope. There are a lot of different telescopes on the market, and some of them are more expensive than others. To tell the truth, the average astronomer does not need an extremely expensive telescope. They can observe what they want to see without spending all of the excess money. However, if you are interested in higher end astronomy, you will not be able to witness it with a lower price ranged telescope. This part is a lot more important than most people might think. The mount connects the cylindrical object that is the telescope to the tripod. You will be able to choose between one of two types of mounts: an equatorial mount or an altazimuth mount. An equatorial mount is designed to look at the sky while the altazimuth mount is designed more like a camera tripod and can be adjusted up and down & back and forth. When light first enters a telescope, it hits the objective, which promptly redirects the light to the appropriate lens. Most telescopes will vary between refracting and reflecting lenses. A refracting telescope makes use of an actual lens called the primary lens as its objective. A reflecting telescope uses one or more curved lens to focus light in different directions to produce the highest quality image. This is the part that holds the pieces that allow the light to come through, which lets you view the stars. Refractors come in different sizes, and they have two different lenses. The focal length of the entire telescope is the total distance between the primary lens (or mirror) and the focal point of the eyepieces (where all light rays meet). With telescopes and indeed most optics, their ability to gather light everything and focus it towards your eye is everything. Not all light rays approach the objective at a straight line, most are curved or bent and need to be redirected towards the eyepiece. However, these bent light rays will not hit the same focal point as the straight facing light rays do. They will hit different focal points that are parallel to the main one. Where all these focal points are lined up is called the focal plane and it is here where all possible light is focused to your eye. How does this pertain to you? Before you purchase a telescope, you’ll probably have to do a little math and determine what you want to be able to see. You probably don’t hear too much about eye relief unless you wear glasses. Eye relief is commonly known as the distance between the outermost lens (the one closest to your eye) and the pupil of your eye that absorbs the light running through the various optics of the telescope. You’ll probably be placing your eye up close and personal with the eyepiece, but those with glasses or contact lenses will have a more difficult time with eyepieces with short eye relief. Those with glasses or contacts should look into orthoscopic eyepieces which provide a narrow and focused view uninhibited by short eye relief. Eyepieces are some of the most delicate pieces of telescopes, and it’s important you know what eyepiece you’re handling before you buy them. For this reason, we recommend you try them out in person at a store, club, or university open to the public. 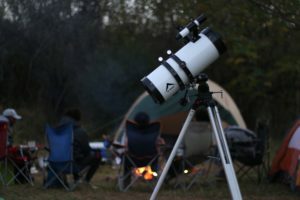 For most telescopes, you only need one eyepiece, but some telescopes will have two or three to make it easier to view different aspects of the stars. For most beginners, the eyepiece is around 25mm. This is large enough to let you see what you wish to, but not too large to distort the images that you find. Don’t be fooled by telescopes advertising “high power” and “high magnification”. In the end, your first telescope purchase will depend on what you want to see and how you want to see it. A “high-powered” telescope may have such powerful magnification that you can’t see what you’re looking at because it’s too bright. Having an eyepiece at a “low-power” will give you a greater field of view. That is—you have a wider field to look at more than one object. This is where you can decide to swap out for a higher magnification lens. Don’t settle for just one eyepiece that is either low or high power. Having more than one is usually the norm. When we talk about eyepieces, the term magnification often comes up as well. This is because the magnification is directly related to the focal length of the entire telescope, and the focal length of the eyepiece. To get magnification, divide the focal length by the focal length of the eyepiece you are currently using. If a focal length is 2500 and the eyepiece is 25, then the magnification 100x (the “x” usually symbolizes magnification). The smallest known eyepiece available to consumers is around 2.5mm while the largest extends beyond 60mm. Different combinations of focal lengths and focal lengths of eyepieces will yield you different sights and perhaps better quality views of the same celestial object. Millimeters stand for the length of eyepieces by their diameter. Not all telescopes are going to have the desired specifications. Before you purchase your first telescope, test its magnification and limits before looking into replacement or more powerful lenses. Since a telescope’s optics are extremely sensitive, you should handle every piece with the utmost care. We don’t want your hard earned money to go down the drain because one of the lenses has a big, dirty finger print on it!